DINE AT A DISCOUNT - DINE OUT BOSTON® IS BACK! Dine Out Boston® (formerly Restaurant Week) is back on the menu August 5-10 & 12-17! Visit dineoutboston.com to see over 150 restaurants, browse menus and make reservations. Presented by the Greater Boston Convention & Visitors Bureau (GBCVB), and sponsored by American Express, Dine Out Boston is celebrating its 18th year of providing diners an opportunity to enjoy the region&apos;s exquisite culinary offerings, and restaurateurs the chance to bring in new guests. This two-week celebration showcases Boston’s diverse restaurant scene. During the two weeks of Dine Out Boston, diners have numerous choices as they enjoy Greater Boston&apos;s finest dining coupled with significant savings. The program’s flexible pricing structure benefits restaurants and guests alike. Restaurants can customize their lunch and dinner menus by choosing price-points: lunch for $15, $20 or $25 and dinner for $28, $33 or $38. Restaurants can offer as many courses as they desire at their selected price! This August, social media mavens are once again invited to share their #dineoutboston pictures on Instagram for a chance to win $100 gift cards to participating restaurants. Follow GBCVB social channels to learn more. "Dine Out Boston spotlights Boston as one of America&apos;s premier culinary destinations, providing patrons from Boston and afar with a unique opportunity to enjoy exceptional value, variety and hospitality in Greater Boston restaurants," said Patrick B. Moscaritolo, President & CEO of the GBCVB. “Diners are invited to take advantage of these restaurant deals while taking in seasonal activities – outdoor markets, the Boston Harbor Islands, whale watching, Red Sox games, or movies and concerts under the stars, coupled with a Dine Out Boston meal, makes for a classic Boston experience!" 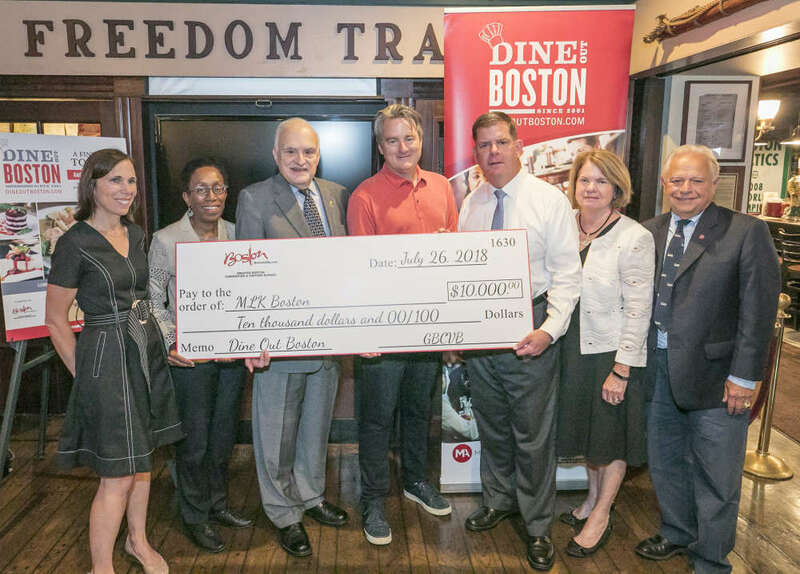 The Dine Out Boston program is once again partnering with the non-profit Foodicine Health to advocate on behalf of patrons who must follow a “Special Diet” because of chronic medical conditions or food allergies. Foodicine Health believes that patronage at restaurants increases when individuals feel that they can safely enjoy a meal that conforms to their prescribed dietary requirements. The GBCVB, in conjunction with Foodicine Health, is asking Dine Out Boston restaurants to include low salt, low-fat, gluten-free, and/or nut-free options on their menus. Dine Out Boston is a bi-annual value-driven dining program founded by the Greater Boston Convention & Visitors Bureau and founding sponsor American Express. Formally known as Restaurant Week Boston®, the program is now in its 18th year of offering exclusive savings throughout the region&apos;s top restaurants. During Dine Out Boston diners can enjoy a chef-customized lunch or dinner for a fraction of the normal dining cost. Due to high demand, reservations during Dine Out Boston are encouraged and can be made in advance at www.DineOutBoston.com.